When the Korean War breaks out, every Marine from every ship and embassy is pulled in and reserves are called up, along with new recruits, to form a Marine Division. Not every man is happy to be called away from their families. Captain Paul Hansen (Richard Carlson) is made a company commander because he was a platoon leader in WWII, even though he has worked in communications since then. However, he tries his best, and eventually becomes a good commander, aided by the experienced Sergeant Novack (Nedrick Young). Their first mission is the Inchon landing, which turns out to be a cakewalk. 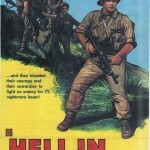 A young recruit Private Jimmy McDermid (Russ Tamblyn), determined to prove himself to his Marine father and brothers, is overcome with fear, but he finds his courage during the fighting for Seoul. Following the capture of Seoul, the division is shipped around the peninsula to Wonsan, and then marches to the Chosin Reservoir, sixty miles from the Yalu River. Aware of MacArthur’s promise that they will be home by Christmas, the men are relaxed but the battalion’s commander, Lt. Col. Steve Corbett (Frank Lovejoy) is worried that the Chinese will enter the war. There is little contact with the enemy but everyone can feel that they are surrounded, and they had already survived a Chinese ambush. Suddenly that night, they hear bugles and the hills are covered with Chinese soldiers. Although surrounded by 100,000 Chinese, the division fights its way out of the trap, battling both the Chinese and frostbite. The movie was made in 1952 when viewers were familiar with the retreat from Chosin, so there is little background, which is unfortunate because the retreat from the Chosin Reservoir is an astonishing achievement. Since the script did not explain the retreat, here is a brief summary. Disregarding Chinese warnings that American troops would not be accepted near the Chinese border, MacArthur sent the Eighth Army and Task Force X northwards, separated by a huge mountain range. The Marine division, commanded by Major General O.P. Smith, was the advance unit of Task Force X, commanded by Major General Ned Almond. Two regiments of the Marine Division had reached the Chosin Reservoir, and the rest of the division was spread out guarding their sole supply route, the Funchilin Pass, a tiny, icy track hacked out of the mountain filled with hairpin turns and steep drops that was 60 to 70 miles long. Almond thirsted for the glory of reaching the Yalu first, but Smith refused to advance until he had secured the supply route. Following the initial attack, the Marines immediately abandoned their planned offensive and focused on getting out of the reservoir alive. Almond had initially refused to accept that there was a huge Chinese army attacking the division because MacArthur’s intelligence had stated that there were only a few Chinese volunteers in North Korea, but the Eighth Army was also reeling from an unexpected Chinese offensive. Being able to say ‘I told you so’ to Almond would have been small consolation, since the Chinese had surrounded the entire division, and the Marines were faced with destruction. Fortunately, Smith’s careful preparation paid off, and the Marine division was able to fight its way out of the trap. While the script is generally faithful to the actual events, a few incidents were Hollywoodized. The entire battalion runs out of ammunition during the first battle and they are about to be massacred by the Chinese when planes arrive just in time to drop ammunition. It is a tense scene, but it did not happen, and it seems strange that the scriptwriter felt that the Marines’ realization that they were surrounded did not offer sufficient tension. 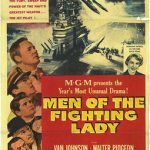 A later scene where fighter planes bomb and strafe the Chinese mercilessly explains why the Chinese never made daylight attacks. It may seem hard to believe, but the Chinese attacks were even more suicidal than shown in the movie. The production did not have enough extras to show hordes of Chinese volunteers, but there are still a lot of Chinese, and corpses litter the hillside after the first battle. The fictional battalion is reduced to a small band of survivors, which is an accurate depiction of the real retreat. One of the worst cases was the Third battalion, 7th Marines, which had shrunk from 1,000 to 120 Marines. The movie clearly uses real footage supplied by the Marine Corps instead of fake special effects. In fact, a scene during the Inchon Landing presents the complex process of loading and firing a battleship’s guns. 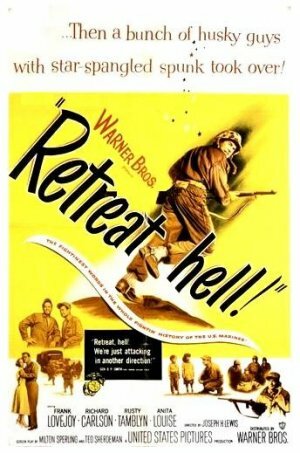 The title “Retreat, Hell!” comes from a statement made by Smith to the press: “Gentlemen, we are not retreating. We are merely advancing in another direction.” A newspaper editor added “Retreat, Hell!” to the statement to make an exciting headline. Filmed on the Marine training camp at Camp Pendleton, they clearly ran out of fake snow, which looks real enough but there is far too little of it. Although frostbite produces more casualties than bullets in the movie, the actual reservoir was much colder, since plasma was useless because it was frozen. Exhausted men would collapse by the roadside, and would have to be kicked to keep moving. 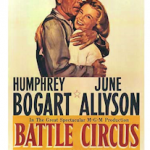 Made on a Marine base with the full cooperation of the Marine Corps and when MacArthur was still worshipped as an iconic general, the script avoids any criticism of the controversial general, and ignores the world outside of the battalion. If the screenwriter had chosen to criticize MacArthur, there was no lack of potential targets. While the Inchon landing had been surprisingly smooth, the street fighting in Seoul was bloody and unnecessary. It would have made more sense to bypass the city, but MacArthur had promised President Rhee that the city would be liberated three months after it had been captured and he did not care if Marines died to fulfil that promise. Warnings of increased contact with Chinese soldiers were ignored, as were requests from the commander of the Eighth Army to slow down the advance and organize the dangerously spread out divisions, which led to huge casualties when the Chinese did attack. Having described himself as an expert on the Asian mind, MacArthur failed to realize that the Chinese would not welcome an American client state defended by a powerful American army as a next-door neighbor. The script is populated by stock characters: the cold-hearted CO who trains his battalion hard to keep them alive; the reluctant officer who learns how to lead; the experienced sergeant who always knows what to do; and the keen recruit who has something to prove. Doesn’t matter. This is not a movie for people who value richly developed characters, and while the characters are made from cardboard, it is sturdy cardboard. A scene where McDermid finds his brother’s corpse is particularly moving. On the plus side, there are no romantic subplots of men having difficulty with their marriages. The wives and families are introduced simply to show what some of the Marines are giving up while serving in Korea. It is not a great movie, and there are a couple more stirring speeches than are required but Retreat, Hell! is a no-nonsense look at the successful retreat from a carefully planned Chinese trap. Wish I could find a way to watch it for free. Any suggestions. Good review that makes me want to watch it. You are on a Korean War kick lately which is informative. Thanks. Accurate commentary on MacArthur – a truly overrated general. I had to buy the dvd. Actually, I had to do it for a few Korean War movies, but I am happy to support Warner Brothers archives because they are bringing out a lot of movies that would disappear otherwise. Just wish they were cheaper. I am always happy to take the opportunity to puncture the belief that MacArthur was a great general. Glad you are enjoying the Korean War reviews. I am supposed to have produced a “best of” list and other articles for the 60th anniversary of the end of the war, but I couldn’t get it done in time. Should be coming out in a month or two.